One of the first images taken by the Discovery Channel Telescope was of the Whirlpool Galaxy, M51. The image was obtained April-May 2012. The Whirlpool Galaxy is a spiral galaxy that is relatively close to Earth — about 30 million light-years away. It is visible in the northern constellation Canes Venatici, just southeast of the Big Dipper. More properly known as M51 or NGC 5194, the galaxy is noted as "one of the brightest and most picturesque" ones that Earthlings can see, according to NASA. The Space Telescope Science Institute (STScI) calls it one of "astronomy's galactic darlings." Among astrophysicists, one of the Whirlpool's highlights is the abundance of supernovas (star explosions) that have been recorded there in recent years. It also is noted for its closeness to companion galaxy NGC 5195, which may be affecting the structure of the Whirlpool itself. It would take about 70 years to learn more about the fuzzy object's structure, however. It was first discerned by William Parsons, using a 72-inch reflector telescope in 1845. "His drawing of the spiral galaxy M51 is a classic work of mid-19th-century astronomy," said Encyclopedia Britannica of Parsons' observations. Parsons' discovery was the first so-called "spiral nebula" ever discovered, and in the five years following he found 14 more of these objects, according to the STScI. It was unclear for decades if these objects were a part of the Milky Way Galaxy or things that were independent of that. It wasn't until Edwin Hubble used Cepheid variable stars to chart cosmic distances in M31 (the Andromeda Galaxy) in the 1920s that astronomers understood they were actually distant galaxies. The Whirlpool galaxy (M51) before (left) and after (right) the eruption of supernova SN 2011dh in May 2011. The image on the left was taken in 2009, and on the right July 8th, 2011. There's been a veritable cornucopia of supernovas in the Whirlpool in recent years. Skywatchers recorded supernovas in 1994, 2005 and 2011. "Three supernovas in 17 years is a lot for single galaxy, and reasons for the supernova surge in M51 are being debated," noted the NASA website Astronomy Picture of the Day in 2011, without elaborating on the possible explanations. The latest supernova, called SN 2011dh, was at its brightest in June 2011 before slipping back into obscurity. After the event, astronomers scoured older pictures to see if they could find the source of the explosion. They narrowed their search to a yellow supergiant star (visible in Hubble Space Telescope pictures) that was there before the explosion, and appears to be missing afterwards. While most yellow supergiants aren't expected to go supernova when they finish out their lives, the team said it's possible that the star was actually a binary star. The other star would have been a bluer, hotter star that was close enough to pull some of the yellow supergiant's mass away. Given enough time, this would have destabilized the star and caused the explosion, astronomers said. The blue star wasn't spotted in Hubble photos, but astronomers added that it is likely best visible in ultraviolet light — a band of light that Hubble does not look at. "The present results reveal the necessity and importance of further studying the evolution and explosion of binary stars," said Melina Bersten of the Kavli Institute for the Physics and Mathematics of the Universe in Japan, who led the team, in a statement. "I look forward to the observation that will confirm our prediction." 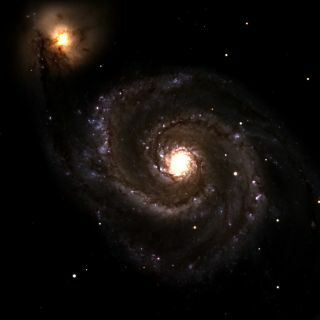 The Whirlpool's arms are one of the more prominent observed in spiral galaxies, STScI noted. The group said this could be because of what they termed a "close encounter" with its companion galaxy, NGC 5195. "As NGC 5195 drifts by, its gravitational muscle pumps up waves within the Whirlpool's pancake-shaped disk. The waves are like ripples in a pond generated when a rock is thrown in the water," STScI stated. "When the waves pass through orbiting gas clouds within the disk, they squeeze the gaseous material along each arm's inner edge. The dark dusty material looks like gathering storm clouds. These dense clouds collapse, creating a wake of star birth." Over time, the biggest stars would then radiate away the surrounding gas, leaving behind blue star clusters that are easily visible in the Whirlpool's arms, STScI added. More generally, the fact that the galaxy is so close by allows astronomers to look at its structure and way it forms stars, with the aim of extrapolating that understanding to other galaxies. In 2015, NASA released an image of the Whirlpool galaxy that the Chandra X-Ray Observatory captured over 250 hours of observation time. The space telescope observed 500 X-ray sources in the galaxy's region, racking up about five times the number of sources observed in previous studies. At least 10 of these sources are believed to come from black holes. With the rise of inexpensive and powerful camera equipment, the Whirlpool is becoming a popular target for amateur astronomers. Space.com has examples of photos taken by amateurs in 2011 and 2015.